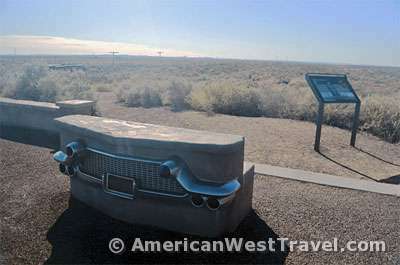 Our brief Thanksgiving Route 66 tour brought us to Petrified Forest National Park where we had not visited since 1999. While national parks are timeless, quite a few changes have taken place: substantial valuable acreage has been added to the park, there is more backcountry access for visitors, a series of “off the beaten path” unmarked trails taking advantage of the open terrain are now offered, and there’s been an uptick of scientific activities relating to various plant and animal fossils. The deserts of northern Arizona do experience winter with evening temperatures well below freezing. However sunny days may offer temperatures in the 50s or better which makes for excellent hiking. We did drive the park road and stop at the major sites but our day’s highlight is the colorful Blue Mesa Trail. And a hike is an excellent activity the day after Thanksgiving. We start at the northern end of the park and work south. This part of the park features some of the best views of the Painted Desert which generally feature bright red badlands. (All the colors in the park are best seen early or late in the day. The views tend to be washed out at midday.) There is petrified wood in this area but not nearly as much as the south half of the park. 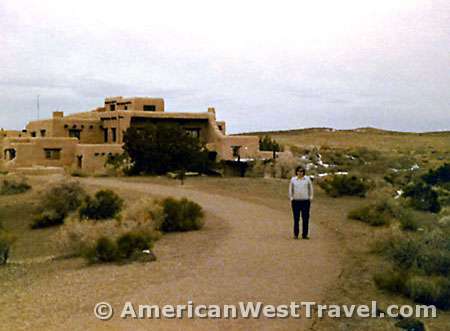 The Painted Desert Trail is an excellent option in this area of the park. 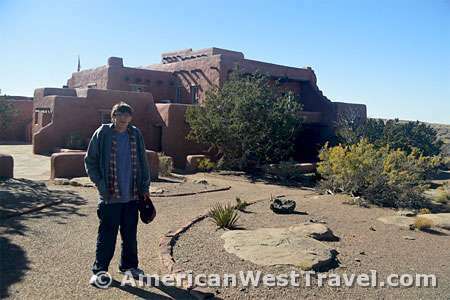 It starts at the historic Painted Desert Inn which is the only Route 66 structure protected by a national park. It was actually a restaurant and snack shop, not a hotel. Several years ago the park service refurbished the inn so it looks much like it did in the Route 66 glory days. The Blue Mesa Trail winds through very colorful badlands which are eroding out of the mesa. 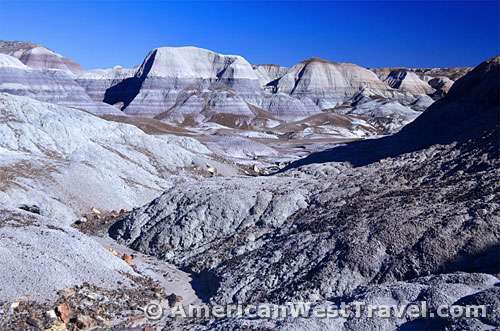 The predominant color of the badlands is blue due to bentonite clay present in the mesa. This is a rare coloration which is best seen early and late in the day. The trail starts on the top of the mesa and goes down to the valley floor. It loops around the semicircular valley at the base of the badlands. The very open nature of the terrain, with little vegetation, makes for excellent exploring. The drainages which cut up the badland hills are especially inviting. 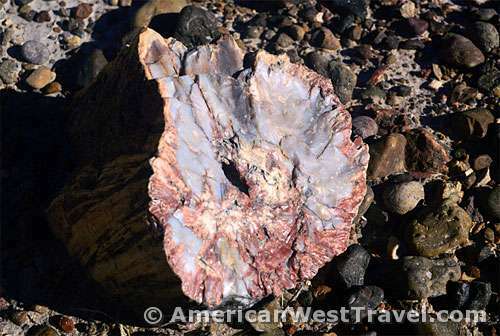 Petrified wood pieces of all sizes and shapes are scattered throughout the valley floor as well as in the drainages. Flash floods through the drainages constantly erode the soft badlands (which you can crumble in your hands) exposing new pockets of petrified wood and potentially other fossils as well. The predominant reddish brown color of the petrified wood makes a gorgeous contrast with the blue color of the terrain. It is easy to think that this was the original color of the trees. However that is not correct; bark does not fossilize. The colors arise from the minerals that were in the soil when the trees fossilized. In this park, the predominant mineral was iron; hence the rust color. 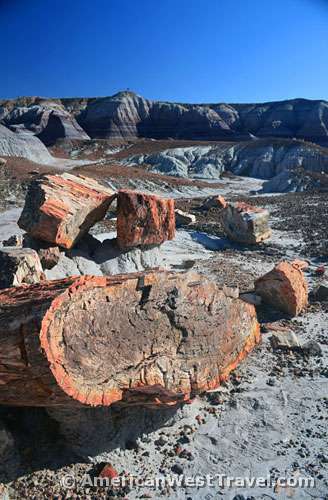 In Utah’s petrified forest, the wood is pitch black, arising out of the presence of carbon. If you examine the cross sections of petrified wood pieces you can often see pockets of wood which have fully crystallized into quartz (Photo, right). They are often a white color but numerous other colorations are possible based on what minerals were present at the time the wood fossilized. There are many area rock shops which have fantastic examples of crystallized wood, even gems such as amethyst which is purple. Keep in mind that you may NOT remove wood or anything else from the national park! You can buy a souvenir piece at any rock shop for less than $10. Photo, below. 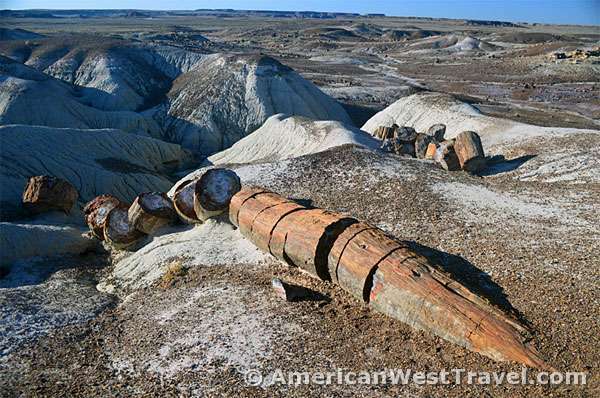 The most spectacular displays of petrified wood are on the Crystal Forest Trail. There are many enormous trunks and other huge pieces. There are numerous whole or near-whole trees lying on the ground. They are always broken into pieces but still laid out as a single tree.